In this tutorial, you learn how to publish to an Amazon SNS topic while keeping the messages secure in a private network. You publish a message from an Amazon EC2 instance that's hosted in Amazon Virtual Private Cloud (Amazon VPC). The message stays within the AWS network without traveling the public internet. By publishing messages privately from a VPC, you can improve the security of the traffic between your applications and Amazon SNS. This security is important when you publish personally identifiable information (PII) about your customers, or when your application is subject to market regulations. For example, publishing privately is helpful if you have a healthcare system that must comply with the Health Insurance Portability and Accountability Act (HIPAA), or a financial system that must comply with the Payment Card Industry Data Security Standard (PCI DSS). Use an AWS CloudFormation template to automatically create a temporary private network in your AWS account. Create a VPC endpoint that connects the VPC with Amazon SNS. Log in to an Amazon EC2 instance and publish a message privately to an Amazon SNS topic. Verify that the message was delivered successfully. Delete the resources that you created for this tutorial so that they don't remain in your AWS account. This network consists of a VPC that contains an Amazon EC2 instance. The instance connects to Amazon SNS through an interface VPC endpoint. This type of endpoint connects to services that are powered by AWS PrivateLink. With this connection established, you can log in to the Amazon EC2 instance and publish messages to the Amazon SNS topic, even though the network is disconnected from the public internet. The topic fans out the messages that it receives to two subscribing AWS Lambda functions. These functions log the messages that they receive in Amazon CloudWatch Logs. This tutorial takes about 20 minutes to complete. Before you start this tutorial, you need an Amazon Web Services (AWS) account. When you sign up, your account is automatically signed up for all services in AWS, including Amazon SNS and Amazon VPC. If you haven't created an account already, go to https://aws.amazon.com/, and then choose Create a Free Account. A key pair is used to log in to an Amazon EC2 instance. It consists of a public key that's used to encrypt your login information, and a private key that's used to decrypt it. When you create a key pair, you download a copy of the private key. Later in this tutorial, you use the key pair to log in to an Amazon EC2 instance. To log in, you specify the name of the key pair, and you provide the private key. In the navigation menu on the left, find the Network & Security section. Then, choose Key Pairs. In the Create Key Pair window, for Key pair name, type VPCE-Tutorial-KeyPair. Then, choose Create. The private key file is automatically downloaded by your browser. Save it in a safe place. Amazon EC2 gives the file an extension of .pem. To set up the infrastructure that supports this tutorial, you use an AWS CloudFormation template. A template is a file that acts as a blueprint for building AWS resources, such as Amazon EC2 instances and Amazon SNS topics. The template for this tutorial is provided on GitHub for you to download. You provide the template to AWS CloudFormation, and AWS CloudFormation provisions the resources that you need as a stack in your AWS account. A stack is a collection of resources that you manage as a single unit. When you finish the tutorial, you can use AWS CloudFormation to delete all of the resources in the stack at once. These resources don't remain in your AWS account, unless you want them to. A VPC and the associated networking resources, including a subnet, a security group, an internet gateway, and a route table. 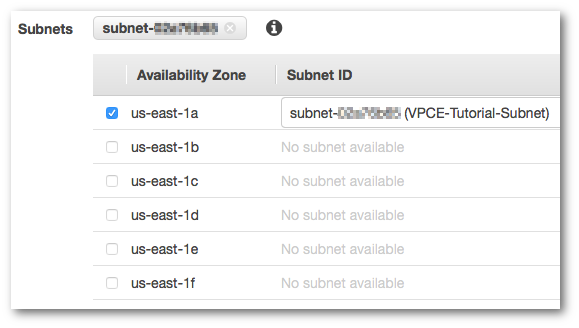 An Amazon EC2 instance that's launched into the subnet in the VPC. Two AWS Lambda functions. 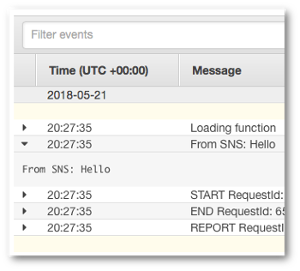 These functions receive messages that are published to the Amazon SNS topic, and they log events in CloudWatch Logs. Amazon CloudWatch metrics and logs. An IAM role that allows the Amazon EC2 instance to use Amazon SNS, and an IAM role that allows the Lambda functions to write to CloudWatch logs. Download the template file from the GitHub website. Sign in to the AWS CloudFormation console. On the Select Template page, choose Upload a template to Amazon S3, select the file, and choose Next. For Stack name, type VPCE-Tutorial-Stack. For SSHLocation, keep the default value of 0.0.0.0/0. On the Options page, keep all of the default values, and choose Next. On the Review page, verify the stack details. Under Capabilities, select the check box that acknowledges that AWS CloudFormation might create IAM resources with custom names. The AWS CloudFormation console opens the Stacks page. The VPCE-Tutorial-Stack has a status of CREATE_IN_PROGRESS. In a few minutes, after the creation process completes, the status changes to CREATE_COMPLETE. Choose the Refresh button to see the latest stack status. The Amazon EC2 instance that was launched in your VPC in the previous step lacks internet access. It disallows outbound traffic, and it's unable to publish messages to Amazon SNS. Verify this by logging in to the instance. Then, attempt to connect to a public endpoint, and attempt to message Amazon SNS. At this point in the tutorial, the publish attempt fails. In a later step, after you create a VPC endpoint for Amazon SNS, your publish attempt succeeds. In the navigation menu on the left, find the Instances section. Then, choose Instances. In the list of instances, select VPCE-Tutorial-EC2Instance. Copy the hostname that's provided in the Public DNS (IPv4) column. Because the connection attempt fails, you can cancel at any time (Ctrl + C on Windows or Command + C on macOS). Open the Amazon SNS console at https://console.aws.amazon.com/sns/. In the navigation menu on the left, choose Topics. On the Topics page, copy the Amazon Resource Name (ARN) for the topic VPCE-Tutorial-Topic. $ aws sns publish --region aws-region --topic-arn sns-topic-arn --message "Hello"
Because the publish attempt fails, you can cancel at any time. To connect the VPC to Amazon SNS, you define an interface VPC endpoint. After you add the endpoint, you can log in to the Amazon EC2 instance in your VPC, and from there you can use the Amazon SNS API. You can publish messages to the topic, and the messages are published privately. They stay within the AWS network, and they don't travel the public internet. Note that the instance still lacks access to other AWS services and endpoints on the internet. In the navigation menu on the left, choose Endpoints. On the Create Endpoint page, for Service category, keep the default choice of AWS services. For Service Name, choose the service name for Amazon SNS. The service names vary based on the chosen region. For example, if you chose US East (N. Virginia), the service name is com.amazonaws.us-east-1.sns. For VPC, choose the VPC that has the name VPCE-Tutorial-VPC. For Subnets, select the subnet that has VPCE-Tutorial-Subnet in the subnet ID. For Enable Private DNS Name, select Enable for this endpoint. For Security group, choose Select security group, and select the one named VPCE-Tutorial-SecurityGroup. Choose Create endpoint. The Amazon VPC console confirms that a VPC endpoint was created. The Amazon VPC console opens the Endpoints page. The new endpoint has a status of pending. In a few minutes, after the creation process completes, the status changes to available. Now that your VPC includes an endpoint for Amazon SNS, you can log in to the Amazon EC2 instance and publish messages to the topic. When the Amazon SNS topic receives a message, it fans out the message by sending it to the two subscribing Lambda functions. When these functions receive the message, they log the event to CloudWatch logs. To verify that your message delivery succeeded, check that the functions were invoked, and check that the CloudWatch logs were updated. Open the AWS Lambda console at https://console.aws.amazon.com/lambda/. On the Functions page, choose VPCE-Tutorial-Lambda-1. 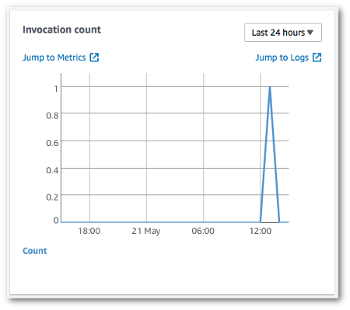 Check the Invocation count graph. This graph shows the number of times that the Lambda function has been run. The invocation count matches the number of times you published a message to the topic. In the navigation menu on the left, choose Logs. Choose the /aws/lambda/VPCE-Tutorial-Lambda-1/ log group. Check that the log includes the entry From SNS: Hello. Choose Log Groups at the top of the console to return the Log Groups page. Then, repeat the preceding steps for the /aws/lambda/VPCE-Tutorial-Lambda-2/ log group. Congratulations! By adding an endpoint for Amazon SNS to a VPC, you were able to publish a message to a topic from within the network that's managed by the VPC. The message was published privately without being exposed to the public internet. Unless you want to retain the resources that you created for this tutorial, you can delete them now. By deleting AWS resources that you're no longer using, you prevent unnecessary charges to your AWS account. First, delete your VPC endpoint by using the Amazon VPC console. Then, delete the other resources that you created by deleting the stack in the AWS CloudFormation console. When you delete a stack, AWS CloudFormation removes the stack's resources from your AWS account. Select the endpoint that you created. Choose Actions, and then choose Delete Endpoint. In the Delete Endpoint window, choose Yes, Delete. The endpoint status changes to deleting. When the deletion completes, the endpoint is removed from the page. Choose Actions, and then choose Delete Stack. In the Delete Stack window, choose Yes, Delete. The stack status changes to DELETE_IN_PROGRESS. When the deletion completes, the stack is removed from the page. If you want to dive more deeply into the concepts introduced in this tutorial, see the following resources.